​The process of refinishing a VCT floor is a multi-step process. It starts with a safety sweep insuring all foreign debris is removed. The stripping of the tile floor starts by applying a wax removing agent using a stripping machine. Once the old wax has been removed the flooring needs to be thoroughly cleaned with a neutralizing agent. Now onto the finishing steps we apply up to five coats of wax applying one at a time this is the longest step in the job due to the dry-time between each coat once the last coat has dried for 24 hours we can use a high speed buffer to apply a high polished shine to the surface. No matter how big or small your project may be. If you’re looking for tile floor cleaning service in Columbus Please fill free to give our office a call today. 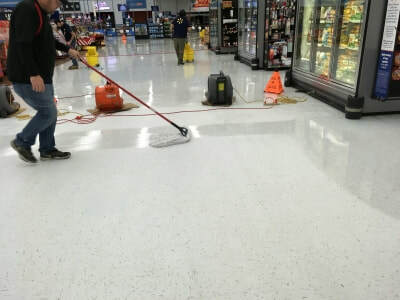 The flooring in your commercial space should be maintained on a daily basis a simple moping routine will keep the tile looking good between stripping. Keeping the shine in your floor can be done by buffing the floor this should be done when the shine in the floor starts to look dull. So when is it time to strip and wax? When the finish starts to wear off in places or the wax takes on a yellow or brownish discoloring.